December 11, 2016 – NASA is preparing to launch a constellation of small satellites designed to aid weather forecasters in understanding and predicting hurricane intensity. The CYGNSS mission’s eight identical microsatellites will team up with the Global Positioning System (GPS) constellation to measure wind speeds over Earth’s oceans and air-sea interactions, information expected to help scientists better understand tropical cyclones, ultimately leading to improved hurricane intensity forecasts. To that end, CYGNSS will focus its attentions on the tropics, taking measurements where hurricanes form — including Hurricane Matthew, which affected Florida in October. This will be the first launch of a Pegasus XL launch vehicle from Kennedy in more than a decade, with such launches typically taking places from Vandenberg Air Force Base in California or the Reagan Test Range on the Kwajalein Atoll. “Because it’s heading to the ‘hurricane corridor,’ we had to launch from Florida,” explained Aly Mendoza-Hill, CYGNSS mission manager for NASA’s Launch Services Program, or LSP. Based at NASA’s Kennedy Space Center in Florida, LSP is responsible for spacecraft to launch vehicle integration and launch management. The Space Physics Research Laboratory at the University of Michigan College of Engineering in Ann Arbor leads overall mission execution in partnership with the Southwest Research Institute in San Antonio, Texas. The Climate and Space Sciences and Engineering Department at the University of Michigan leads the science investigation, and the Earth Science Division of NASA’s Science Mission Directorate oversees the mission. The CYGNSS satellites and Pegasus XL rocket went through most of their prelaunch preparations in Orbital ATK’s facility at Vandenberg. The rocket arrived there in April 2016 and the satellites followed in September. Following rocket assembly and checkout, the eight observatories were mated to their deployment module and tested. Finally the CYGNSS payload was encapsulated in the rocket’s protective payload fairing, and the vehicle was attached to the Stargazer aircraft. In an ironic twist, Hurricane Matthew sideswiped Kennedy Space Center and Cape Canaveral Air Force Station in early October. Forecast to make landfall on Florida’s Space Coast as a Category 4 storm, Matthew’s intensity decreased and its path wobbled slightly east of predictions. It moved past the spaceport on the morning of October 7 as a still-powerful Category 3 hurricane. 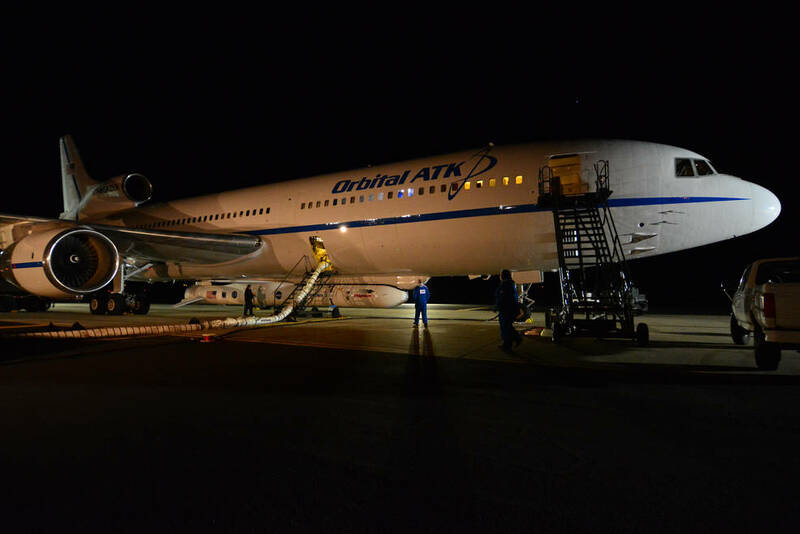 Although the CYGNSS payload, Pegasus XL rocket and Stargazer aircraft were safe in California at the time, the storm still impacted the launch date. The Stargazer aircraft made the cross-country flight to Florida on Friday, Dec. 2, touching down on the Skid Strip in the afternoon with the Pegasus XL rocket already secured to its underside. Following their arrival, the spacecraft, vehicle, aircraft underwent several days of testing to ensure they are all ready for the flight ahead. Early Monday morning, the Stargazer will take off from the Skid Strip and carry the Pegasus XL rocket aloft to a designated point. From there, the rocket is dropped, and after a short freefall, it launches horizontally in midair as its first engine burn begins. The plane will be more than 100 miles off the coast of Florida before the rocket is released. The best way to watch the launch is on NASA TV or on the agency’s website. A prelaunch program by NASA EDGE will begin at 3:45 a.m. MST. Launch coverage and commentary begins at 4:45 a.m. MST. The CYGNSS satellites are expected to be in orbit with their solar arrays deployed within about 15 minutes of launch, with solar array deployment about 10 minutes after each separation, setting the stage for a two-year mission to improve hurricane forecasts that in turn could protect lives and property in coastal communities. The Southwest Research Institute (SwRI) in San Antonio built the CYGNSS micro satellites. SwRI will host the mission operations center at its Boulder, Colorado location. Sierra Nevada Corporation developed the deployment module for the satellites.